Risotto is one of my favorite comfort foods, and is probably one of the most versatile things you can make at home. The base is always Arborio rice—an Italian short grain rice with a creamy and chewy texture—and brought to life with stock and other fresh ingredients. If in your pantry you have Arborio rice, fresh herbs, left over vegetables (raw or cooked), and a bit of stock or broth, then an easy and cozy dinner can be ready in under 30 minutes (I love that!). This would also make a fabulous side dish when paired with something like Crispy Eggplant - Oven Style. For my Basil Pesto Risotto, I chose to make a version of homemade pesto, swapping out some of the olive oil for heavy cream. Using all oil made the finished dish too oily, but the addition of heavy cream made the risotto slightly creamy and more elegant. Because fresh basil and peas are available in most grocery stores year round, take the extra time to make the pesto from scratch, and shuck the peas by hand—you will be amazed at the difference it makes when it comes to flavor and satisfaction! Place all of the ingredients into the glass jar of a blender and puree until mostly smooth. Set aside. Place the fresh (or frozen) peas in a bowl of very hot tap water for 5 minutes. Drain and set aside. In a small Dutch oven heat the butter and olive oil over medium heat. Once hot, add the onions, salt, and pepper. Cook for 5 – 7 minutes, stirring occasionally. Add the Arborio rice and cook for another 2 – 3 minutes, until lightly toasted. Next, pour the hot stock over the onion and rice mixture and bring to a boil. Then reduce the heat to low, cover, and simmer for 18 – 20 minutes, stirring occasionally. Once almost all of the liquid is absorbed by the rice, turn off the heat and stir in the pesto sauce, peas, and lemon zest, and Parmesan cheese. Serve immediately. Idea: If you do not have a small Dutch oven, any 10-inch skillet with a tight fitting lid will work just fine. Tip: If you want to make this ahead of time and serve it later, reheat over low heat with a few tablespoon of heavy cream. This will allow the rice to be warmed through without becoming dried out. 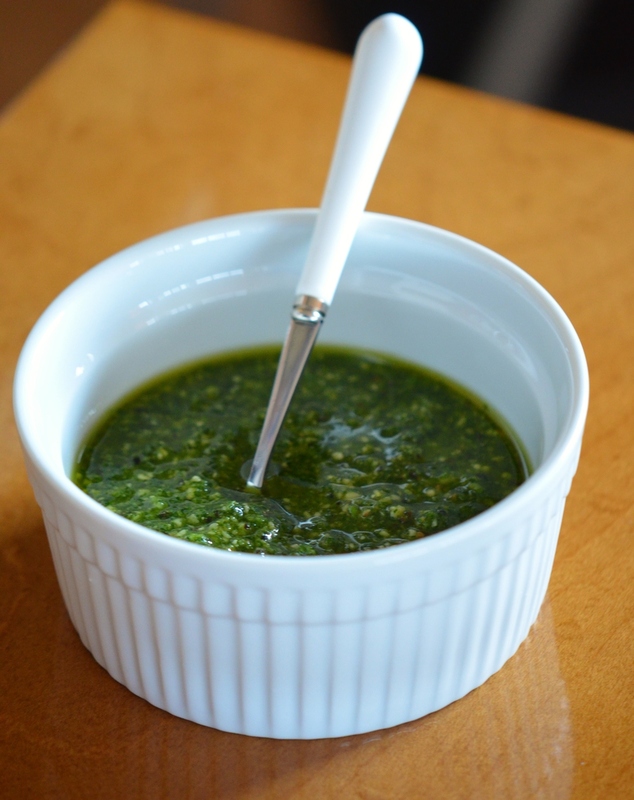 Surprise your taste buds with a twist on traditional pesto with my Fresh Parsley Pesto! Shinning bright with parsley flavor, rich olive oil, and salty Parmigiano-Reggiano this easy and unique addition to soups, pastas, and sandwiches will add new life to old favorites! Best of all, it’s all made in a food processor in under 2 minutes. Eat well, laugh often, and share the love! Happy eating! Watch my webisode of From My Kitchen to Yours - A Chic Autumn Lunch for a complete tutorial. In the bowl of an electric mixer fitted with a steal blade add the parsley, pine nuts, parmesan, garlic, salt, and pepper. Process for 30 seconds. With the processor still running, slowly pour the olive oil down the feed tube. Process until the mixture is thoroughly pureed. Tip: Serve this alongside my Thyme & White Bean Soup. Trick: You can also store the pesto in the refrigerator or freezer in an air tight container with a thin layer of olive oil on top.